8 Responses to Pedagogically driven…? Cheers Derek and to Russel too. A couple of thoughts. Sometimes I wish we could find a more expansive word than ‘personalisation’. It feels like it implies that the learning context becomes singular and somehow separate. 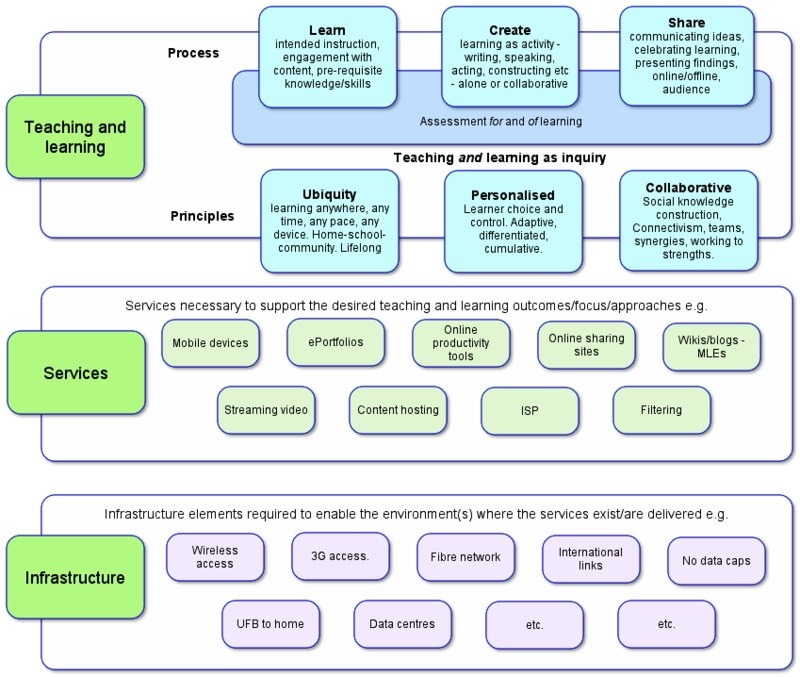 Whereas what I think you are recognising and advocating for is that we create learning environments that from the outset make space for all kinds of learners and learning styles. Imagine if learners could bring with confidence their backgrounds, interests, skills, strengths and weaknesses through the school gate AND the shape of the learning environment embraced and catered for that level of diversity across the whole of the school day. For me that is when the use of technology makes sense. Because to meet that variability we need speech and audio and music and video and graphics and text and 3d representation, we need mobility, access to expertise beyond our 4 walls, connections with community … And so ‘collaboration’ becomes something with teeth, not some tick box on an assessment that says “Johnny got a merit in group work”. That is also when ubiquity has meaning, because learners want to connect outside school hours with each other and with the integral members of or sources for their collaborations. Learned about this diagram at your presentation today, Derek – and much more besides. Thanks for an engaging talk! @ Chrissie – "Imagine if learners could bring with confidence their backgrounds, interests, skills, strengths and weaknesses through the school gate AND the shape of the learning environment embraced and catered for that level of diversity across the whole of the school day." What's stopping us from doing that now? Is it really technology or an inherited mindset about the function of schooling and its purpose? "That is also when ubiquity has meaning, because learners want to connect outside school hours with each other and with the integral members of or sources for their collaborations."